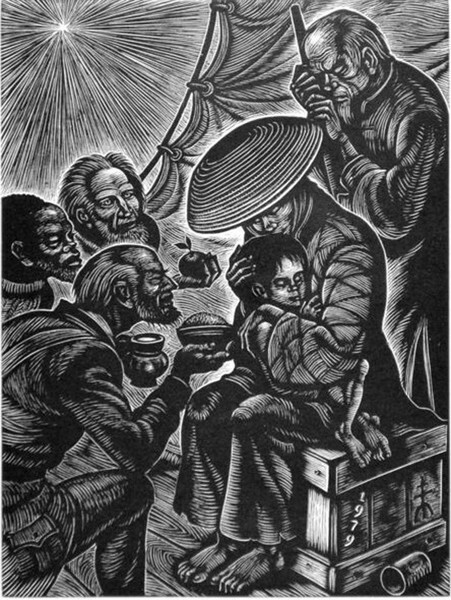 Fritz Eichenberg, printmaker extraordinaire for The Catholic Worker newspaper, created this image of foreign potentates bringing gifts of food to the Child who heralds new life for U.N.'s International Year of the Child. That year the refugee crisis struggling for the world's attention and compassion was that of the Vietnamese boat people, 54,000 of whom fled their war devastated country on leaky small boats in just the month of June. Wealthy countries eventually agreed to an Orderly Departure Program enabling refugees to migrate legally to the United States, France, Australia, and Canada. Millions have fled Syria; many more would escape Yemen and war torn countries in the horn of Africa if they could; desertification, warming, and conflict drive people to move in the Sahel; and Central Americans flee their failing states. Today too many refugee children are beyond the help of any visitors. 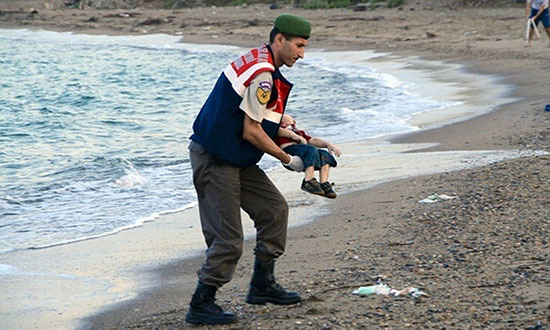 The body of Syrian refugee 3 year old Aylan Kurdi washed up on a Greek beach in 2015. As of last June, 34,361 people have died trying to cross the Mediterranean to Europe in the last 20 years. I know no easy answers, but I will refuse to look away. Worst of all, seems not to be ending. Hope your holidays have been happy.